(Erlanger, USA) April 1, 2014 — TOYOTA BOSHOKU AMERICA, INC. (Headquarters: Erlanger, KY, CEO: Shigetoshi Miyoshi), a premier manufacturer of automotive interior systems, announced today that it has received its first orders for service bumper business from Toyota. Production began in March at the Lebanon plant of its subsidiary, TOYOTA BOSHOKU KENTUCKY, LLC (TBKY). This marks the first time that Toyota Boshoku has been awarded service bumper business in North America. “Toyota Boshoku America is pleased to secure this award from Toyota, which highlights our ability to provide world-class quality in both interior and exterior components,” said Shigetoshi Miyoshi, Chairman and CEO of Toyota Boshoku America. “We welcome the opportunity to expand our business in North America, and are proud to bring this additional business to the Lebanon community.” In expectation of the growth in this new business, TBKY expanded its plant, increasing the number of employees by approximately 50. TBKY currently employs 130 people. 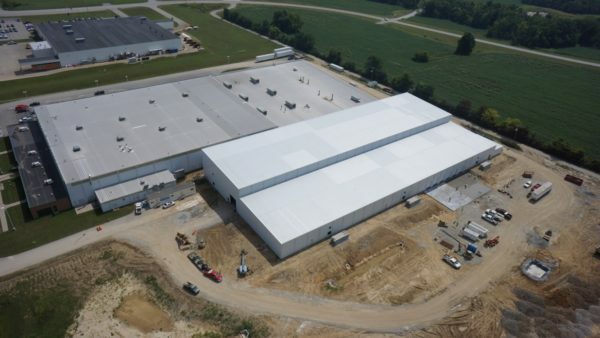 Founded in 2003, the TBKY Lebanon plant produces headliners and products that improve noise and vibration performance for door trim and floor carpets delivered to Toyota’s Georgetown Plant. TBKY Lebanon is located in a strong manufacturing community, ideal for supplying service bumpers. TOYOTA BOSHOKU KENTUCKY, LLC was established in Kentucky in April 2003, with locations in Bardstown, Harrodsburg and Lebanon, KY. A workforce of 130 (as of March 2014) at the Lebanon location will manufacture Headliners, Silencer Products and Service Bumpers in a building of 20,000m2 in size on a site of 75,000m2. About TOYOTA BOSHOKU AMERICA, INC.
Toyota Boshoku America, a Toyota Boshoku company and member of the Toyota Group of businesses, was established in 2001. Toyota Boshoku America is a premier manufacturer of automotive interior systems which include seats, door trims, headliner stratas, headliners, carpets, fabrics, straps and round recliners in addition to air and oil filter systems and service bumpers for a variety of customers. Toyota Boshoku America’s North American headquarters are in Erlanger, KY. Toyota Boshoku America and its affiliates have over 10,000 team members in 20 plants and facilities throughout Canada, the U.S., Mexico, Brazil and Argentina, all committed to delivering world-class quality products. Toyota Boshoku America’s Technical Center is in Novi, Michigan.